Don't you love it when you give a friend a little something you've made and she says that she'll keep it forever? Handmade does equal Joy (squared). You get the joy of creating and giving and the recipient gets the joy of receiving a handmade goodie that is not only adorable, but YOU made it just for her. Joy all around, right? People tend to keep handmade items they receive, so it's joy for years to come. This little cutie is all ready to give joy to you and someone else. Download Pilgrim Girl below. I made five of the gable treat boxes for my friend, Margaret, to give to her friends to show just how thankful she is for them. My mom and Margaret also created keepsakes for Louisa. They both made blankets and Mom also made the darling crocheted hat. Here is the farmer card I promised awhile back. (You can see that post here.) He's part of an adorable stamp set that is available in my etsy shop. He did work perfectly with the stitched truck from PTI and he was a lot of fun to color. Very happy with how it turned out! You might remember these fun strip paper pumpkins from last year. You can see just how easy they are to make in THIS post. I used them for my table place card holders on our Thanksgiving table last year. You can download the darling Pilgrim Girl HERE. Dropbox seems to work differently for different people. When the image appears, wait a moment and a download button will appear in the top right corner. If download button does not appear, right click on the image and save as. I'm always happy to email the image to you - if neither method works! Enjoy creating this week and spreading joy to people you surprise with your wonderful creations! Oh, your box is just adorable with that sweet paper and the cute Pilgrim Girl!! Love that cute button and the seam binding bow, too! Thank you very much for the free download and for the inspiration! A beautiful post my dear! Love all of your creations! Thanks for sharing! Oh Man, these are so so adorable!!!! 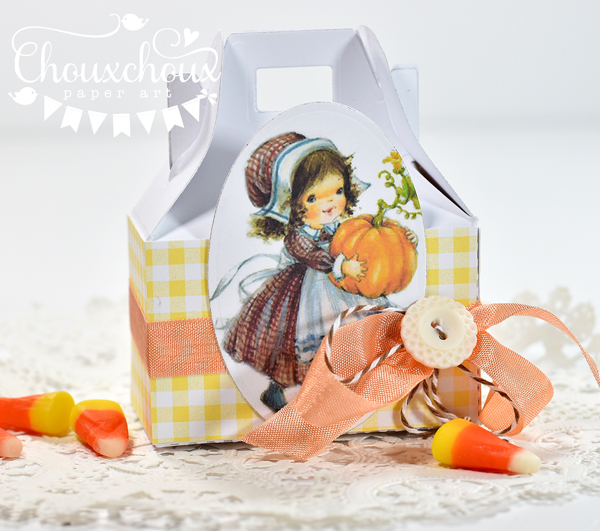 Beautiful sweet box with the little pilgrim girl, Lori!! 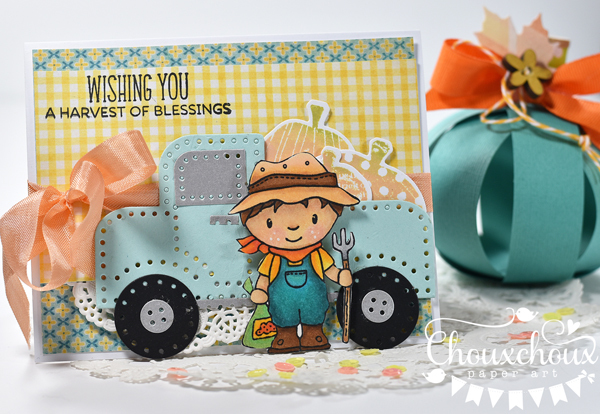 Love the card with the farm boy, too! But adorable Louisa steals the show!! She is just darling in the crocheted hat...what a doll!!! So many cuties here to look at today, Lori! 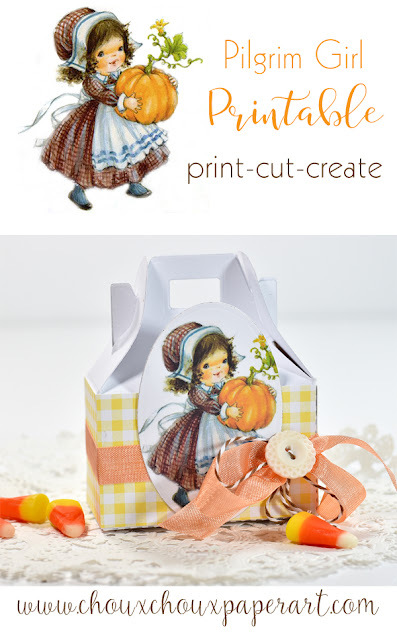 Your little pilgrim girl box is adorable! You find the sweetest vintage images! Little Louisa is so precious! What a joy! 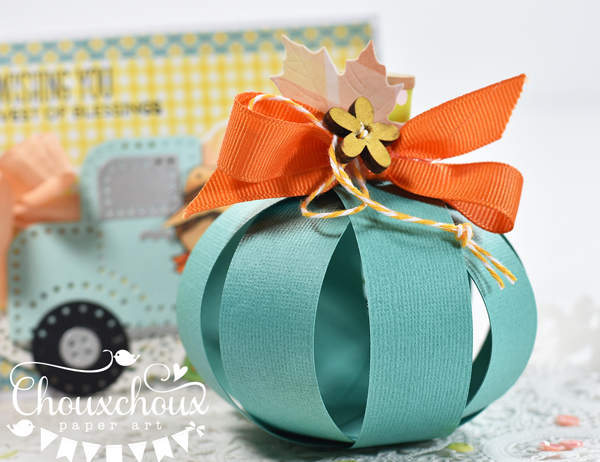 Love your farmer card and paper pumpkin too! 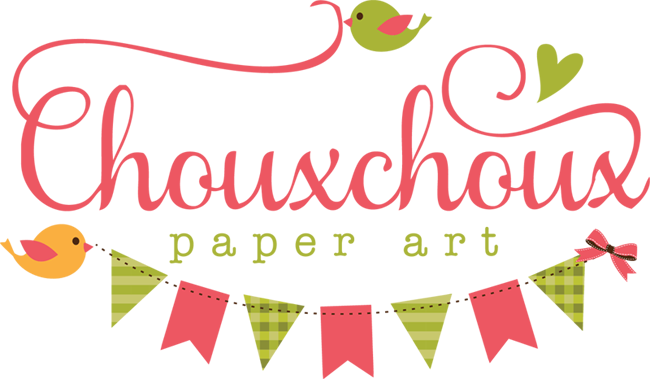 I agree with you 100% about creating and giving handmade cards! All of your creations are so cute Lori! I love that sweet little pilgrim girl and that fabulous paper pumpkin! Adorable pictures of your granddaughter too! Such an adorable baby girl--congrats again, Lori! I used to make baby blankets, but never as beautiful as these & the hat is just too cute! I love the box--truly a treasure & your card is such a sweet scene. The turquoise pumpkin is so unexpected & beautiful! You know... you really distracted me with that beautiful baby.. omg precious!! And that box is soooo cute!! Love the farmer too... I forgot I wanted to check that set out.... going there now! Your new grand daughter is adorable ....congratulations. Love the pretty mix of colours on your creations! Still love this adorable farmer... I FINALLY used my stamp set! 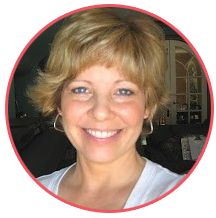 It's up today if you want to see it....thanks for all of your inspiration always, Lori! Who Else is Looking for Adorable Pilgrims?